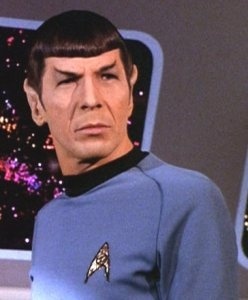 The venerable Leonard Nimoy is going to be hanging up his blue shirt, bowl haircut, and tricorder very soon. Spock, one of the most well known characters from the Star Trek franchise since its inception in the late 1960s, is soon to be gone as we once knew him. Leonard Nimoy, the actor that played Spock for more than 30 years, has announced that he is retiring from show business and the Star Trek convention circuit soon. Beyond a few more appearances, Nimoy plans to live out the rest of his days without pointy ears and the overuse of logic. He recently reprised the role of "old" Spock in J.J. Abrams' Star Trek film remake, and has a small part as the mysterious William Bell in Abrams' television show Fringe. However, he doesn't plan to take on anymore acting work. "I want to get off the stage. Also, I don't think it would be fair to Zachary Quinto," Nimoy told the Toronto Sun. Quinto, also known for playing Sylar on Heroes, took on the role of "young" Spock in Abrams' Star Trek film. Nimoy is more than happy to hand over the role, saying: "[Quinto] is a terrific actor, he looks the part, and it's time to give him some space. And I'm very flattered the character will continue." Nimoy's retirement has nothing to do with an identity crisis. At 79 years old, Nimoy has been in the business for an amazing 60 years. "Since Star Trek began, I've never had to worry about where the next job was," he says. If only everyone could be so lucky. He's done more than just act, also directing multiple Star Trek movies and making appearances throughout the entertainment landscape. The bottom line is: if you want to meet Leonard Nimoy without having to climb over his fence and get arrested, you might want to figure out where he'll be in the coming weeks. He deserves a decade or two without rabid fans asking him to pinch their necks every five minutes.